Ex-Sheriff Joe Arpaio Convicted Of Criminal Contempt : The Two-Way The former sheriff for Maricopa County, Ariz., was found guilty Monday of willfully ignoring a federal judge's order. The case stemmed from his campaign against illegal immigration. Joe Arpaio leaves a federal courthouse in Phoenix earlier this month. The former Maricopa County sheriff was found guilty Monday of criminal contempt, a charge that carries a maximum sentence of six months in jail. Joe Arpaio, the former sheriff who garnered nationwide attention for his crackdown on illegal immigration, has been convicted of criminal contempt by a federal judge in Arizona. The ruling carries a possible maximum sentence of six months in jail and a monetary fine for the 85-year-old Arpaio. The misdemeanor criminal conviction handed down Monday by District Judge Susan Bolton found that Arpaio knowingly violated a federal judge's order in 2011. At that time, Arpaio was told he could not detain immigrants simply because they lacked legal status — but for 18 months, his deputies carried on with the practice. "In December 2011, U.S. District Judge G. Murray Snow issued a preliminary injunction ordering Arpaio and his deputies to stop targeting Latino drivers. Prosecutors allege that Arpaio's deputies defied the injunction for at least 18 months. In May 2013, Snow ruled that Arpaio's office had engaged in racial profiling. "Arpaio and his deputies have admitted to violating the judge's order, but they claim their defiance wasn't intentional." For these violations, Arpaio was found to have committed civil contempt. But Arpaio has long maintained he did not do so intentionally — and so is innocent of criminal contempt — because the judge's order was unclear. As member station KJZZ notes, "his attorneys argued that the violations were a result of poor communication and a lack of understanding by Arpaio and his command staff." Now, Bolton has rejected Arpaio's argument. He "willfully violated the order by failing to do anything to ensure his subordinates' compliance and by directing them to continue to detain persons for whom no criminal charges could be filed," Bolton said in her decision. During his 24 years as sheriff of Maricopa County, which contains the Phoenix metro area, the self-styled "America's Toughest Sheriff" found plaudits in many conservative circles for his severe enforcement policies — and deep criticism from others who said his practices amounted to racial profiling. That long tenure ultimately ended last November when he lost his re-election bid, just two weeks after being slapped with the criminal contempt charge. 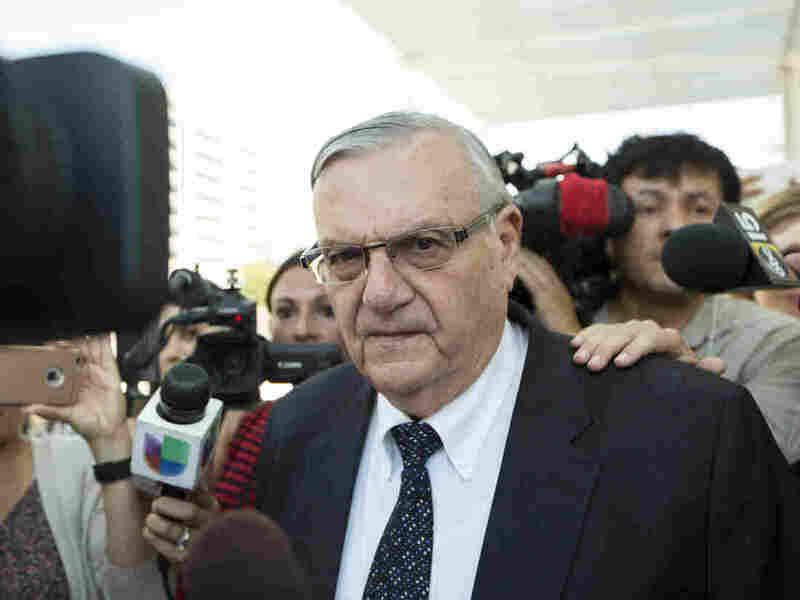 "Arpaio's supporters believe this criminal case is really about politics — Democrats trying to hurt a Republican sheriff," Jude Joffe-Block and Amita Kelly reported for NPR last month. "Those supporters hoped the Trump administration would drop the criminal case" — but federal prosecutors continued to press forward anyway. In a statement released Monday, the Maricopa Sheriff's Office called the verdict "a conclusion to the disservice and distractions caused by former Sheriff Joe Arpaio." "As for this office," the department continued, "we remain steadfast in our efforts to serve the needs of public safety, to improve quality of relations with the community and to ensure that the men and women of this organization have the utmost respect for the law and the authority for which we are empowered." MALDEF, the Mexican American Legal Defense and Education Fund, said, "The ruling essentially recognizes that local police lack the constitutionally-required evidence to detain or arrest undocumented immigrants who entered the country without inspection or who overstayed a visa." The group said requiring officers to enforce immigration law puts them at "risk of being found guilty of significant legal violations." In an earlier version of this post, U.S. District Judge Susan Bolton was misidentified as Susan Bolt.